Diving from a spacious yacht is much more comfortable than with any speedboat. Especially if you are traveling with family with kids. Join daily Samui dive tours and get to the best dive sites. For your comfort and safety, we carry a maximum of only 10 divers on any of our dive tours. Our absolute maximum group size with any one of our Instructors or Divemasters is just 4 divers. We always endeavor to keep divers of the same experience level together in our groups and give you at sites appropriate to your level of training. As the leading Scubapro Partner Centre in the Gulf of Thailand our dive rental equipment is uniquely top specification and you will not find better rental gear anywhere on Koh Samui. The boat departs at 08.00, returns at 15:30, journey time 1hr 30mins (each way). Koh Tao generally offers the best visibility and optimum dive conditions whether diving or snorkeling with a diverse and versatile range of dive sites to suit the experience level of all divers. From the shallow and picturesque bays such as Mango bay, Aow Leuk and Hin Wong perfect for students and those divers looking for relaxed and gentle diving (great for snorkelers as well) to the intermediate dive sites such as Green Rock, White Rock and Shark Island, while Chumpon Pinnacle is best suited to the more experienced diver. 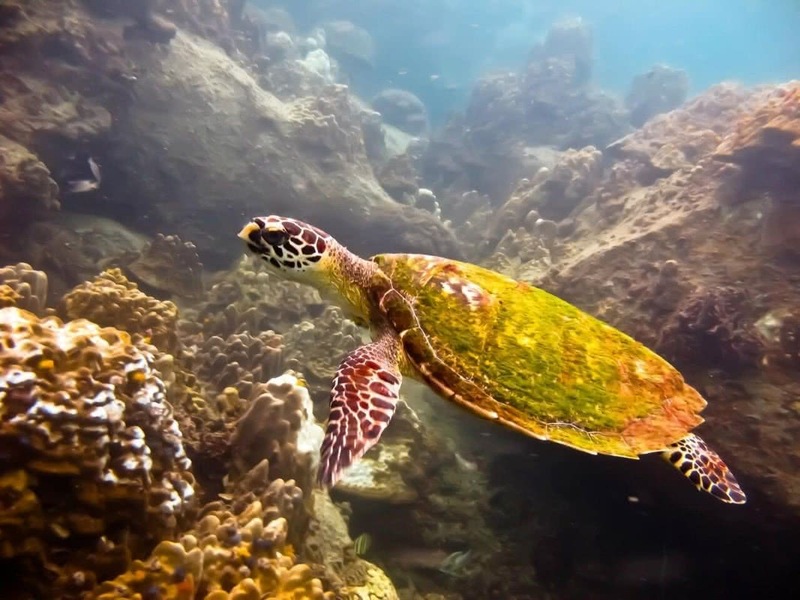 The tour is very much suited to a combined diving/snorkeling tour, so non-diving partners are always welcome to enjoy the fantastic underwater world that Koh Tao has to offer. The boat departs at 07.20, returns at 13:00, journey time 1hr (each way). Sail rock is considered to be the 5-star dive site in the Gulf, lying mid water between Koh Phangan and Koh Tao, it is a granite pinnacle that rises from the sea floor at 30m to stand an impressive 15m above the surface. If offers the diver stunning underwater topography in which to explore sheer vertical walls, beautiful coral gardens, and a unique vertical swim through. It’s home to an extraordinarily abundant variety of marine life in all shapes and sizes. The dive tour with a difference offering “two tours during one day”. A relaxed morning dive enjoying the unique marine life that inhabits the coral gardens of Koh Wao Yai or Koh Wao Lek, followed by a full guided tour of the rest of the famous national park. Explore and enjoy the beautiful topside scenery of this protected environmental reserve comprising of 42 islands – with kayaking, visiting the Emerald Lake viewpoint and monkey spotting at Koh Wuatalap. The perfect day out for couples, families, and groups with divers and non-divers to enjoy the day together whether your interests lie above or below the waves. 02.15 Arrives at Fishermans Village and transport back to hotels. While enjoying your stay on beautiful Koh Samui, whether you are an experienced qualified diver, or a novice wanting to take the plunge and discover the amazing world of Scuba Diving. We can provide the ideal opportunity for your group to adventure under the waters of the Chumphon Archipelago visiting world famous diving sites. All tours starting from beautiful Fishermans Village. All our trips are onboard the beautiful Sao Samui, Samui’s favorite purpose built dive cruiser. Complete with the tank holding and gearing up decks, large diving platform and easy access in and out of the water. In addition of speed and comfort to the dive sites, our diving services are Koh Samui’s Premier Diving Services. Traveling to the dive sites, while either lying and sunbaking on the bow of the boat, sitting on the breezy top deck or receiving a dive briefing, discover scuba dive or course instruction below decks, our boat provides the ultimate in dive cruising comfort. We can tailor a trip to meet any of your needs. Or alternatively, you just let us arrange the trip based on many years of knowledge of the region, with details as follows. Sail Rock Arguably one of Asia’s premier dive sites. This pinnacle rises 10 meters above the surface and descends to depths of 40 + Meters. Is best suited for open water or advanced open water divers. Although it also has a 12-meter training ledge often used for dives 2 and 3 of an open water diving course. Reviews for "Private diving tours"